Late night infomercials driving you crazy? So poorly made? So badly acted? Selling unbelievable stuff? 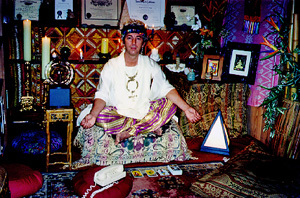 For April Fool’s Day in 1994, to satirize the proliferation of both New Age psychics and ambulance chasing attorneys, Joey Skaggs wrote and produced a 30 second TV commercial in which he portrayed a psychic attorney called Maqdananda. The commercial aired 40 times throughout the last week of March on CNN Headline News in Hawaii. Nobody questioned its veracity, even though the attorney, dressed like a swami, sits cross-legged surrounded by candles, incense and crystals. The phone number at the end of the spot is 1-808-UCA-DADA. The outgoing message on the answering machine said, “I knew you’d call.” Dozens of callers left messages. The machine collected all the incoming inquiries. None were answered.